Editors Note: (Ralph Turchiano) This article was withdrawn, due to claims “ that the methodology is seriously flawed, and the claims that the article makes are unjustified “. A Clean PDF of the original study Here. The Conclusion to the retracted study shall be posted first, out of traditional order. In summary, both Al and Gardasil vaccine injections resulted in behavioral and cognitive abnormalities in mice (Figs. 1–3). Furthermore, immunostaining analysis showed an increase in the Iba-1 density in the CA1 area of the hippocampus in Gardasil-immunized mice in comparison to Al-injected mice, thus suggesting that CA1 might be vulnerable to neuro inflammation as a result of Gardasil immunization (Fig. 6). In addition, we observed that the brain protein extract significantly inhibited in a dose-dependent manner, the binding of total IgG isolated from the sera of Gardasil-immunized mice to HPV L1 antigens from the vaccine. Therefore, it is likely that mice immunized with the HPV vaccine developed cross-reactive anti HPV antibodies which in addition to binding to the HPV L1 capsid protein, may also bind to brain auto-antigens. The putative target antigen(s) should be further identified by immune precipitation and proteomics analyses (Fig. 5). In light of these findings, this study highlights the necessity of proceeding with caution with respect to further mass immunization practices with a vaccine of yet unproven long-term clinical benefit [20,52] which is capable of inducing immune mediated cross-reactions with neural antigens of the human host. Especially considering the continually increasing number of serious disabling neurological adverse events linked to HPV vaccination reported in the current medical literature (Supplementary Table 1) and vaccine surveillance databases . Finally, in light of the data presented in this manuscript, new guidelines should be requested on the use of appropriate placebos in vaccine safety trials . Vaccine adjuvants and vaccines may induce autoimmune and inflammatory manifestations in susceptible individuals. To date most human vaccine trials utilize aluminum (Al) adjuvants as placebos despite much evidence showing that Al in vaccine-relevant exposures can be toxic to humans and animals. We sought to evaluate the effects of Al adjuvant and the HPV vaccine Gardasil versus the true placebo on behavioral and inflammatory parameters in young female mice. Six week old C57BL/6 female mice were injected with either, Gardasil, Gardasil + pertussis toxin (Pt), Al hydroxide, or, vehicle control in amounts equivalent to human exposure. At six months of age, Gardasil and Al-injected mice spent significantly more time floating in the forced swimming test (FST) in comparison to vehicle-injected mice (Al, p = 0.009; Gardasil, p = 0.025; Gardasil + Pt, p = 0.005). The increase in floating time was already highly significant at three months of age for the Gardasil and Gardasil + Pt group (p ≤ 0.0001). No significant differences were observed in the number of stairs climbed in the staircase test nor in rotarod performance, both of which measure locomotor activity. Since rotarod also measures muscular strength, collectively these results indicate that differences observed in the FST were not due to locomotor dysfunction, but likely due to depression. Additionally, at three months of age, compared to control mice, Al-injected mice showed a significantly decreased preference for the new arm in the Y maze test (p = 0.03), indicating short-term memory impairment. Moreover, anti-HPV antibodies from the sera of Gardasil and Gardasil + Pt-injected mice showed cross-reactivity with the mouse brain protein extract. Immunohistochemistry analysis revealed microglial activation in the CA1 area of the hippocampus of Gardasil-injected mice compared to the control. It appears that Gardasil via its Al adjuvant and HPV antigens has the ability to trigger neuroinflammation and autoimmune reactions, further leading to behavioral changes. Abbreviations: Al, aluminum; ASIA, autoimmune/autoinflammatory syndrome induced by adjuvants; 2-GPI, 2-glycoprotein I; FST, forced swimming test; HPV, human papilloma virus; Pt, pertussis toxin; U.S. FDA, United States Food and Drug Administration. ∗ Corresponding author at: Zabludowicz Center for Autoimmune Diseases, Sheba Medical Center, Hashomer, 52621 Ramat-Gan, Israel. Tel. : +972 3 5308070. E-mail addresses: shoenfel@post.tau.ac.il, Yehuda.Shoenfeld@sheba.health.gov.il (Y. Shoenfeld). http://dx.doi.org/10.1016/j.vaccine.2015.12.067 0264-410X/© 2016 Elsevier Ltd. All rights reserved. Like other drugs, vaccines can cause adverse events, but unlike conventional medicines, which are prescribed to people who are ill, vaccines are administered to healthy individuals. Hence there is an added concern regarding risks associated with vaccinations. While most reported side effects from vaccines are mild and transient, serious adverse events do occur and can even be fatal [1,2]. There are currently major stumbling blocks in our understanding of the exact mechanisms by which such events can be triggered. The main reason for this is the poor methodological quality of many clinical studies that evaluate vaccine safety and the lack of indepth research into adverse phenomena . In addition, adverse events may not fit into a well-defined category of an autoimmune disease but rather, present themselves as a constellation of non-specific symptoms (i.e., arthralgia, myalgia, fatigue, nausea, weakness, paraesthesia, depression, mild cognitive disturbances etc.) . Another complicating factor in researching vaccine-related adverse events is that the latency period between vaccination and the development of an overt and diagnosable autoimmune and/or neurological disease can range from days to many months [4–6], likely depending on individuals’ genetic predispositions and other susceptibility factors (i.e., previous history of autoimmune disease or previous history of adverse reactions to vaccines). From the above it is clear that establishing a definite causal link between vaccinations and disease manifestations in humans remains a complex task. Thus the potential risks from vaccines remain currently ill-understood and controversial. A further obfuscation to our understanding of potential risks from vaccinations stems from the persistent use of aluminum (Al) adjuvantscontaining placebos in vaccine trials . Indeed, contrary to popular assumptions of inherent safety of Al in vaccines there is now compelling data from both human and animal studies which implicates this most widely used adjuvant in the pathogenesis of disabling neuroimmuno-inflammatory conditions [8–11]. Due to their capability of enhancing the immune response to foreign antigens, substances with adjuvant properties have been used for decades to enhance the immunogenicity of human and animal vaccines . Because of their immune-potentiating capacity, adjuvants enable the usage of smaller amount of antigens in vaccine preparations and are thus attractive from a commercial standpoint. Nonetheless, enhanced immunogenicity also implies enhanced reactogenicity. Indeed, although Al acts as an effective vehicle for the presentation of antigens, this process is not always benign since the adjuvant itself is intrinsically capable of stimulating pathological immune and neuro-inflammatory responses [9–11,13–16]. In spite of these data, it is currently maintained by both the pharmaceutical industry and drug regulating agencies that the concentrations at which Al is used in vaccines does not represent a health hazard . Apart from potential hazards associated with adjuvant use, other ingredients in vaccines also have the capacity of provoking undesirable adverse events. Indeed, since the mechanisms by which the host’s immune system responds to vaccination resemble the ones involved in the response to infectious agents, a recombinant or a live attenuated infectious antigen used for vaccination, may inflict a range of immune and autoimmune responses similar to its parallel infectious agents [18,19]. The HPV vaccine Gardasil is one of many vaccines currently on the market that is adjuvanted with Al. Since the licensure by the U.S. Food and Drug Administration (FDA) and subsequent introduction on the market in 2009, the HPV vaccine has been linked to a variety of serious neurological and autoimmune manifestations. Notably, out of 152 total cases identified via PubMed 129 (85%) are related to neuro-ophthalmologic disorders (Supplementary Table 1). It should be noted that the pattern of adverse manifestations emerging from HPV vaccine case reports, matches that reported through various vaccine safety surveillance systems worldwide, with nervous system and autoimmune disorders being the most frequently reported . safety profile of Gardasil, as well as the Al adjuvant, in the current study, we evaluated and compared the effects of Al and whole HPV vaccine formulation versus that of a true placebo on behavioral, neurohistological and autoimmune parameters in young female C57BL/6 mice. Six-week old C57BL/6 female mice, were obtained from Harlan Laboratories (Jerusalem, Israel), and were housed in the animal facility at Sheba Medical Center. The mice were raised under standard conditions, 23 ± 1 ◦C, 12-h light cycle (6:30 am to 6:30 pm) with ad libitum access to food and water. The Sheba Medical Center Animal Welfare Committee approved all procedures. Six-week old C57BL/6 female mice received three injections (spaced 1 day apart) of either (a) quadrivalent HPV vaccine Gardasil, (b) Gardasil + pertussis toxin (Pt), (c) Al hydroxide or (d) vehicle control (19.12 mg/mL NaCl, 1.56 mg/mL l-histidine). The number of injected animals was 19 per experimental group. Gardasil, Al and vehicle were injected intramuscularly (i.m. ), while the Pt was given intraperitoneally (i.p.). The amount of injected Al and the HPV vaccine were the equivalent of human exposure. In particular, each mouse in the Gardasil and Gardasil + Pt group received 0.25 L of Gardasil (dissolved in 20 L of vehicle solution). 0.25 L of Gardasil is the equivalent of a human dose since the average weight of a 6week old mice is approximately 20 g. Gardasil is given as a 0.5 mL dose to teenage girls of cca 40 kg. Thus a 20 g mouse receives cca 2000× less of the vaccine suspension than a human. Similarly, each mouse in the Al adjuvant group received 5.6 g/kg body weights Al hydroxide dissolved in 20 L vehicle solution. A single Gardasil dose contains 225 g of Al and is given to a cca 40 kg female. This equates to 5.6 g Al hydroxide/kg body weight. The mice in the Pt group received 250 ng of Pt with each injection of Gardasil. Pt was added to this group for the purpose of damaging the blood–brain barrier. Since the actual adjuvant form used in Gardasil, amorphous Al hydroxyphosphate sulfate (AAHS), is a proprietary brand of the vaccine manufacturer and is not commercially available, we used Alhydrogel as a substitute. The behavior of mice was evaluated at three and six months post immunization for (1) locomotor function and depression by the forced swimming test (FST), (2) locomotor and explorative activity by the staircase test, (3) cognitive functions by the novel object recognition and Y maze tests and (4) strength and motor function by the rotarod test. Following the first round of behavioral testing at three months of age, 5 mice from each of the four experimental groups were sacrificed and brain tissues were collected and processed for histological examinations. Blood specimens were also collected at this time for serological analysis. Forced swimming test. The FST is the most widely used model of depression in rodents It is commonly used for evaluation of antidepressant drugs, and experiments aimed at inducing and examining depressive-like states in basic and pre-clinical research [23,24]. Nonetheless, it should be noted that increased floating time in the FST apart from being indicative of depressive behavior can also indicate locomotor dysfunction. For the purpose of this test, mice were placed in individual glass beakers (height 39 cm, diameter 21.7 cm) with water 15 cm deep at 25 ◦C. On the first day, mice were placed in the cylinder for a pretest session of 10 min, and later were removed from the cylinder, and then returned to their home cages. Twenty-four hours later (day 2), the mice were subjected to a test session for 6 min. The behavioral measure scored was the duration (in seconds) of immobility or floating, defined as the absence of escape-oriented behaviors, such as swimming, jumping, rearing, sniffing or diving, recorded during the 6 min test. Staircase test. Locomotor, explorative activity and anxiety were evaluated by the staircase test, as described previously by Katzav et al. . In this test, stair-climbing and rearing frequency are recorded as measures of general locomotor function, exploratory activity and anxiety/attention. The staircase maze consisted of a polyvinyl chloride enclosure with five identical steps, 2.5 × 10 × 7.5 cm. The inner height of the walls was constant (12.5 cm) along the whole length of the staircase. The box was placed in a room with constant lighting and isolated from external noise. Each mouse was tested individually. The animal was placed on the floor of the staircase with its back to the staircase. The number of stairs climbed and the number of rears were recorded during a 3-min period. Climbing was defined as each stair on which the mouse placed all four paws; rearing was defined as each instance the mouse rose on hind legs (to sniff the air), either on the stair or against the wall. The number of stairs descended was not taken into account. Before each test, the animal was removed and the box cleaned with a diluted alcohol solution to eliminate smells. Novel object recognition test. This is a visual recognition memory test based on a method described by Tordera et al. . The apparatus, an open field box (50 × 50 × 20 cm), was constructed from plywood painted white. Three phases (habituation, training and retention) were conducted on three separate test days. Before the training session, the mice were individually habituated by allowing them to explore the box for 10 min (day 1). No data were collected at this phase. During training sessions (day 2), two identical objects were placed into the box in the northwest and southeast corners (approximately 5 cm from the walls), 20 cm away from each other (symmetrically) and then the individual animal was allowed to explore them for 5 min. Exploration of an object was defined as directing the nose to the object at a distance of ≤1 cm and/or touching it with the nose and rearing at the object; turning around or sitting near the object was not considered as exploratory behavior. The time spent in exploring each object was recorded as well as the number of interactions with both objects. The animals were returned to their home cages immediately after training. During the retention test (day 3), one of the familiar objects used during the training session was replaced by a novel object. Then the animals were placed back into the box, and allowed to explore the objects for 5 min. The same parameters were measured as during the training session, namely, the time spent in exploring each of the two objects and the number of interactions with them. All objects were balanced in terms of physical complexity and were emotionally neutral. The box and the objects were thoroughly cleaned by 70% alcohol before each session to avoid possible instinctive odorant cues. A preference index, a ratio of the amount of time spent exploring any one of the two items (old and new in the retention session) over the total time spent exploring both objects, was used to measure recognition memory. Y maze test. The Y maze test was used to assess spatial short-term memory and interest in novel environments. It was comprised of three arms, built of black Perspex. Each arm was 8 × 30 × 15 cm at an angle of 120◦ from the others. One arm was randomly selected as the start arm. Each mouse was placed twice in the start arm. On the first trial, lasting for 5 min, one of the other two arms was randomly chosen to be blocked whereas on the second trial, lasting for 2 min, both arms were open. The two trials were separated by a 2 min interval, during which the mouse was returned to its home cage. The time spent in each of the arms was measured. Between each trial and between each mouse, the maze was cleaned with a 70% alcohol solution and dried. Discrimination of spatial memory was expressed by a preference index: time in the new arm − time old arm/time in the new arm + time in the old arm, assessing spatial memory. A normal cognitively non-impaired mouse is expected to recognize the old arm as old and spend more time in the new arm. Rotarod. The rotarod was used to test general motor function and motor learning . The time that a mouse could remain walking on a rotating axle (3.6 cm diameter; speed of rotation: 16 rpm) without either falling or clenching onto the axle was measured. Each mouse was tested three times for 60 s. A day prior to testing the mice were habituated to the rotarod. Results are expressed as the mean ± SEM. The differences in mean for average immobility time in the FST, the staircase test parameters (number of rearing and stair-climbing events), novel object recognition and Y maze tests were evaluated by t-test. Significant results were determined as p < 0.05. The mice were anesthetised by an i.p. injection of ketamine (100 mg/kg) and xylazine (20 mg/kg) and sacrificed by transcardiac perfusion with phosphate buffered saline (PBS) followed by perfusion with 4% paraformaldehyde (PFA, Sigma-Aldrich Israel Ltd., Rehovot Israel) in phosphate buffer (PO4, pH 7.4). After perfusion, the brain was quickly removed and fixed overnight in 4% PFA (in PO4, pH 7.4) at 4 ◦C. On the following day, the brain was cryoprotected by immersion in 30% sucrose in 0.1 M PO4 (pH 7.4) for 24 to 48 h at 4 ◦C before brain cutting. Frozen coronal sections (30 to 50 m) were cut on a sliding microtome (Leica Microsystems GmbH, Wetzlar, Germany), collected serially and kept in a cryoprotectant at −20 ◦C until staining. The levels of autoantibodies in the mice sera were tested by a home-made ELISA one month post injection. The targeted antigens were: Gardasil vaccine which contains the HPV L1 major capsid protein of HPV types 6, 11, 16 and 18, mouse brain protein extract, mouse brain phospholipid extract, Al hydroxide, dsDNA, and 2glycoprotein-I 2GPI). ELISA plates were coated with the target proteins, dsDNA or Al hydroxide at 20 g/mL PBS/well and incubated overnight at 4 ◦C. Washed plates were blocked with 3%BSA in PBS 1hr at 37 ◦C. Sera were added at dilution of 1:200 for 2 h at room temperature. The binding was probed with goat anti-mouse IgG conjugated to alkaline phosphatase at concentration of 1:5000 for 1 h at 37 C. Following appropriate substrate, the data were read by ELISA reader at 405 nm. 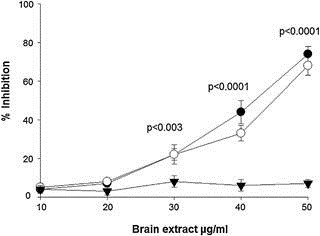 Brain protein extracts were prepared by lysis of brains from five healthy C57BL/6 mice, using ice-cold lysis buffer containing 50 mM Tris (pH 7.5), 150 mM NaCl, 10% glycerol, 1% Triton X-100, 1 mM EDTA, 1 mM PMSF, 1 mM sodium vanadate, 0.1% protease inhibitor mixture (Sigma-Aldrich L-4391 St Louis, MO, USA) for 30 min on ice and centrifuged at 13,000 rpm for 20 min. The lysate was dialyzed against PBS. Protein concentration was determined by BCA Protein Assay Kit (Pierce, Thermo scientific, Rockford, IL, USA). ELISA plates were coated with HPV L1 major capsid protein of HPV types 6, 11, 16 and 18. Following blocking with 5% skim milk powder, sera from the immunized mice, at different dilutions 1:200–1:10,000, were added to the plates in order to define 50% binding of the sera to the HPV. Next, dilutions of sera which showed 50% binding to HPV were incubated overnight at 4 ◦C with different concentrations of mouse brain protein extract (10–50 g/mL) as the inhibitor. The following day, the mixtures were subjected to ELISA plates coated with HPV for 2 h at room temperature. The binding of the antibodies which did not create complex with the brain protein extract, was probed with anti-mouse IgG conjugated to alkaline-phosphatase, followed by the appropriate substrate. The percentage of inhibition was calculated as follows: % inhibition = 100 − [(OD of tested sample without inhibitor − OD of tested sample with inhibitor)/(OD of tested sample without inhibitor)] × 100. Brain sections were stained free-floating, incubated with the first antibodies overnight at 4 ◦C. The slices were then washed in PBS + 0.1% Triton X-100, and incubated at room temperature for 1 h with the corresponding fluorescent chromogens-conjugated secondary antibody. Sections were stained for specific antigens with antibodies against activated microglia (anti-Iba-1, polyclonal, Abcam, Cambridge, UK) and astrocytes (anti-GFAP monoclonal, Dako, Carpinteria, CA, USA). Counter staining was performed with Hoechst (Sigma-Aldrich Israel Ltd., Rehovot Israel). Iba-1 and GFAP immunostaining was visualized using ×4/0.1 NA, ×10/0.25 NA and ×40/0.65 NA objective lenses on a Nikon eclipse 50i fluorescence microscope equipped with a Nikon DS Fi1 camera. In order to minimize bleaching of the fluorescence, images were obtained by serially moving the slide with no fluorescence and then acquiring the images in a standard manner. All sections were then studied quantitatively for differences in immunostaining density among the groups, using ImageJ software (NIH, USA). Region of interests (ROIs) were drawn manually using the ‘Polygon selection’ tool. Brain regions were identified using a mouse brain atlas. ROIs were chosen to represent anatomical regions previously shown to be involved in cognition and/or to exhibit variable sensitivity to neuroinflammation in other models. The mean intensity of the specific ROIs (×10 magnification) was recorded for each individual animal recorded (Analyze Measure) and data were analyzed using SPSS statistical software (version 15.0). Univariate analysis was conducted for each ROI/Antibody separately using ‘group’ as a fixed factor and ‘experiment’ as a Covariate. Post-hoc analysis, One-way ANOVA, Student’s t-test, simple regression, or correlation analysis were used when appropriate, according to the experimental design. Significance level was determined in 1-tailed and 2-tailed tests. The level of statistical significance of differences is p < 0.05. 0.1 < p < 0.05 is defined as a trend. After the behavioral testing at three months of age, compared to other groups, Al-injected mice showed a significant increase in rearing frequency in the staircase test, a measure for increased anxiety (p = 0.02; Fig. 1A). There were no significant differences in the overall locomotor function between the groups, as measured by the number of stairs climbed in the staircase apparatus (not shown). Moreover, compared to control mice, Al-injected mice showed a significantly decreased preference for the new arm in the Y maze test, indicating short-term memory impairment (p = 0.03; Fig. 2A). 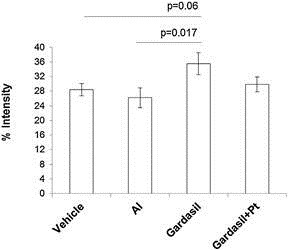 In addition, the two groups injected with the Gardasil vaccine spent significantly more time floating in the FST compared to both control mice and Al-injected mice (p < 0.0001; Fig. 3A). No significant differences in behavior were observed in the novel object recognition test. Fig. 1. Effects of Al, Gardasil and Gardasil + Pt toxin injections on exploratory activity and anxiety in C57BL/6 female mice as evaluated by the staircase test. Results are presented as the number of rears (mean ± SEM) during a 3 min testing period. (A) Three months post-injection; (B) six months post-injection. Fig. 2. Effects of Al, Gardasil and Gardasil + Pt toxin injections on spatial memory in C57BL/6 female mice as evaluated by the Y maze test. Results are presented as a mean ± SEM preference index for spending time in a new arm (time in the new arm − time old arm/time in the new arm + time in the old arm). (A) Three months post-injection; (B) six months post-injection. during the 6 min test. (A) Three months post-injection; (B) six months post-injection. that differences observed in the FST were not due to locomotor dysfunction, but rather, likely due to depression. One month post injection of either Al, Gardasil and Gardasil + Pt, the profile of serum antibodies was analyzed at dilution of 1:200. Elevated levels of antibodies recognizing Gardasil components, including the HPV L1 capsid protein of HPV types 6, 11, 16 and 18 (p < 0.002), as well as anti-brain protein extract (p < 0.002) and antibrain phospholipid extract antibodies (p < 0.001) were observed in the two groups of mice that received the HPV vaccine(Fig. 4. The titers of anti-HPV antibodies, anti-brain protein extract and anti-brain phospholipid extract antibodies were reduced after two months (data not shown). No elevation in the titers of anti-Alhydroxide, anti-dsDNA and anti-2GPI antibodies, were detected in the sera of any of the four treatment groups of mice (Fig. 4). The binding of anti-HPV antibodies from the sera from the two treatment groups immunized with Gardasil to HPV L1 antigens, was significantly inhibited by the mouse brain protein extract in a dose dependent manner in comparison to Al-injected mice whose sera were negative for anti-HPV antibodies (Fig. 5). Fig. 4. Titers of serum antibodies one month post injection with either Al (A), Gardasil (G), Gardasil + Pt toxin (Gp) and vehicle (V). A home-made ELISA was used to detect the levels of anti-HPV, anti-Al hydroxide (Alum), anti-mouse brain protein extract, anti-mouse brain phospholipid (PL) extract, anti-dsDNA, and anti2glycoprotein-I (2GPI) antibodies in the sera of immunized mice. Pools of sera (n = 5 per treatment group) were used as samples. All sera samples were assayed in triplicate. Data are presented as mean OD 405 ± SEM. Fig. 5. Inhibition of the binding of anti-HPV L1 antibodies from the sera of Gardasilinjected mice to HPV antigens by the mouse protein extract. Pools of sera (n = 5 per treatment group) were used as samples. All sera samples were assayed in triplicate. Data are presented as mean (% Inhibition) ± SEM where % inhibition = 100 − [(OD of tested sample without inhibitor − OD of tested sample with inhibitor)/(OD of tested sample without inhibitor)] × 100 ()Al, Gardasil, Gardasil + Pt. Fig. 6. Iba-1 immunostaining in the CA1 area of the hippocampus of C57BL/6 female mice injected with Al, Gardasil and Gardasil + Pt toxin. Brain sections from 5 animals out of each group were examined quantitatively for differences in immunostaining density using ImageJ software (NIH, USA) as described in Materials and Methods. The data are presented as % mean (% Intensity) ± SEM. and used for brain immunostaining procedures. With this relatively small group size, there were no clear changes between the groups in both astrocyte and microglia staining in any of the regions of interests we investigated (CA1, CA3, dentate gyrus and the striatum). Nonetheless, there was a significant difference between the groups in the density of Iba-1 immunostaining using one-tailed analysis (p = 0.046). Further post-hoc analysis revealed significant increase in Iba-1 density in the CA1 of Gardasil-immunized mice compared to Al-injected mice (p = 0.017; Fig. 6). These results suggest that the CA1 might be vulnerable to small changes in neuroinflammation as a result of Gardasil immunization. The present results show long-term alteration of behavioral responses and neuroinflammatory changes in mice as a result of Al and Gardasil vaccine injection in exposure doses which are equivalent to those in vaccinated human subjects. In particular, mice injected with Al and Gardasil spent significantly more time floating in the FST test (measure indicative either of locomotor dysfunction or depressive behavior), compared to control animals (Fig. 3). In contrast, no significant differences were observed in the number of stairs climbed in the staircase test nor in rotarod performance, both of which are indicative of locomotor activity. In particular, regarding the latter, all mice remained on the rotarod without either falling or clenching onto the axle for 60 s in all three trials. Since rotarod also measures muscular strength as well as locomotor function, collectively these results indicate that differences observed in the FST between the Gardasil and Al-injected mice versus the vehicle control mice were not due to locomotor dysfunction, but most likely due to depression. In addition, the Al-injected group showed impairment in spatial memory in the Y maze test (Fig. 2A) and abnormal responses to a novel environment, which initially was manifested as increased anxiety (Fig. 1A) and later, as a non-selective attention deficit (Fig. 1B) as measured by the number of rears in the staircase test. The number of stairs and rears in this test are normally used to provide measures of general physical motor abilities and level of interest in the novelty of the environment. Rearing in response to environmental change (i.e., removing a mouse from the home cage and placing the animal in an open box or a stair-case apparatus) is often considered an index of non-selective attention in rodents, while rearing during object investigation likely reflects selective attention . Abnormal responses to a novel environment in the Al group are also confirmed by the Y maze test which apart from spatial memory also provides a measure of the rodent’s interest in exploring the new arm of the maze apparatus (Fig. 2A). We further observed significant increase in levels of anti-HPV antibodies, and antibodies targeting brain-protein extract and brain-phospholipid extract components in the two groups of mice that received the Gardasil injection (Fig. 4). Moreover, the binding of anti-HPV L1 capsid protein antibodies from the sera of Gardasil-immunized mice to HPV antigens was inhibited in a dose dependent manner, by the mouse brain protein extract (Fig. 5). On the basis of these results it would appear that the anti-HPV antibodies from Gardasilvaccinated mice have the capacity to target not only the HPV antigens but also brain antigen(s), either directly or via negatively charged phospholipids. Finally, we observed significant inflammatory changes in the Gardasil-injected mice, namely, the presence of activated microglia in the CA1 area of the hippocampus (Fig. 6). does not constitute an appropriate placebo choice. animal models, and those associated with administration of adjuvanted vaccines in humans are neurological and neuropsychiatric . These observations should not be particularly surprising given Al’s well-established neurotoxic properties [39,40]. What has however been argued, is that the concentrations at which Al is used in vaccines are not sufficient to cause neurotoxicity [17,41]. This argument however is not supported by recent evidence. It should be noted that the long-term biodistribution of nanomaterials used in medicine is largely unknown. This is likewise the case with the Al vaccine adjuvant, which is a nanocrystalline compound spontaneously forming micron/submicron-sized agglomerates. It has been recently demonstrated that Al adjuvant compounds from vaccines, as well as Al-surrogate fluorescent nanomaterials, have a unique capacity to cross the blood–brain and blood-cerebrospinal fluid barriers and incite deleterious immunoinflammatory responses in neural tissues [10,13,42]. Thus a proportion of Al particles escapes the injected muscle, mainly within immune cells, travels to regional draining lymph nodes, then exits the lymphatic system to reach the bloodstream eventually gaining access to distant organs, including the spleen and the brain. Moreover, the Trojan horse-mechanism by which Al loaded in macrophages enters the brain, results in the slow accumulation of this metal, due to lack of recirculation [10,42]. The sustained presence of Al in central nervous system tissues is likely responsible for the myriad of cognitive deficits associated with administration of Al-containing vaccines in patients suffering from post-vaccination chronic systemic disease syndromes including macrophagic myofasciitis (MMF) [9,11,36]. Thus contrary to prevalent assumptions, Al in the adjuvant form is not rapidly excreted but rather, tends to persist in the body longterm. As demonstrated by Khan et al. , intramuscular injection of Al-containing vaccine in mice is associated with the appearance of Al deposits in distant organs, such as spleen and brain which were still detected one year after injection. Similarly, Al-particle fluorescent surrogate nanomaterials injected into muscle were found to translocate to draining lymph nodes and thereafter were detected associated with phagocytes in blood and spleen. Particles linearly accumulated in the brain up to the six-month endpoint. They were first found in perivascular CD11b+ cells and then in microglia and other neural cells. The ablation of draining lymph nodes dramatically reduced the biodistribution of injected Al-fluorescent surrogate nanocompounds. In addition, the nanoparticle delivery into the brain was found to be critically dependent on the major monocyte chemoattractant protein MCP-1/CCL2 as intramuscular injection of murine rCCL2 strongly increased particle incorporation into intact brain while CCL2-deficient mice had decreased neurodelivery . of the reasons for the long retention of Al adjuvants in bodily compartments including systemic circulation is most likely due to its tight association with the vaccine antigen or other vaccine excipients . Even dietary Al has been shown to accumulate in the central nervous system over time, producing Alzheimer’s disease type outcomes in experimental animals given dietary equivalent amounts of Al to what humans consume through a typical Western diet . mulate in brain cells, inducing nerve and blood vessel damage and protein degradation in the brain. Persistent accumulation of nanoAl compounds regardless the source (i.e., vaccines, dietary etc.) in the central nervous system may thus increase the likelihood of the development of acute and/or chronic neurological disorders. With respect to the particular Al compounds used in HPV vaccines, AAHS in Gardasil and ASO4 (3-0-desacyl-4-monophosphoryl lipid A (MPL) adsorbed onto Al hydroxide) in Cervarix, it should be noted that these new adjuvants induce a much stronger immune response than conventional Al adjuvants used in other vaccines (i.e., Al hydroxide and Al phosphate) . Stronger immunogenicity of an adjuvant formulation also implies by default stronger reactogenicity and risk of adverse reactions. Because of the differences in immune-stimulating properties between different Al adjuvant compounds, safety of a particular adjuvant formulation cannot be a priori assumed on the basis of the allegedly good historical track record of other formulations. Rather, they need to be thoroughly evaluated case by case. According to the U.S. FDA, a placebo is, “an inactive pill, liquid, or powder that has no treatment value” . From the literature cited above as well as the present study, it is obvious that Al in adjuvant form is neither inactive nor harmless and hence cannot constitute as a valid placebo. Commenting on the routine practice of using Albased adjuvants as placebos in vaccine trials Exley recently stated that it is necessary to make a very strong scientific case for using a placebo which is itself known to result in side effects and that no scientific vindication for such practice is found in the relevant human vaccination literature . Conceivably, there is even less justification for using a novel and more potent Al formulation than those that have been in standard use (Al phosphate and hydroxide). The only aim that this practice achieves is to give potentially misleading data on vaccine safety. Moreover, it is unethical to give a placebo to healthy clinical trial subjects that has no benefit but rather, may cause harm. As noted above, we observed significant elevation of antibodies recognizing Gardasil components, which includes HPV L1 capsid protein of HPV types 6, 11, 16 and 18 (p < 0.002), and of antibodies targeting the mouse brain protein (p < 0.002) and phospholipid extracts (p < 0.001) in the sera of Gardasil-immunized mice (Fig. 4). The binding of anti-HPV antibodies from the sera of mice injected with Gardasil to HPV L1 antigens, was inhibited in a dose dependent manner by using mouse brain protein extract as the inhibitor (Fig. 5). 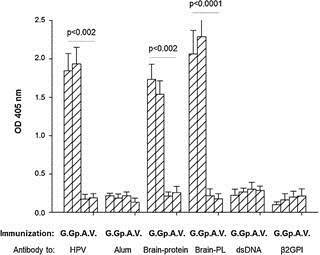 Taken together these results suggest that the anti-HPV L1 antibodies from Gardasil-vaccinated mice have the capacity to target not only the HPV L1 antigens but also brain antigen(s), either directly or via negatively charged phospholipids. antibodies were detected in this patient, the remarkable effectiveness of immunoadsorption plasmapheresis strongly suggested that some unidentified antibodies were involved in the pathophysiology of ACA . Citing the work of Kanduc , the authors of this case have stated that further research on molecular mimicry between human proteins and HPV16 L1-derived peptide is needed to determine the exact pathologic mechanism of ACA . Altogether, these observations suggests that possible immune cross-reactions derived from utilization of HPV L1 antigens in current HPV vaccines might be a risk for cardiovascular and neurological autoimmune abnormalities [49,51]. Our observation that nearly 85% (129/152) of HPV vaccine adverse case reports in the current scientific literature relate to neuro-ophthalmic abnormalities may lend further support for this conclusion (Supplementary Table 1). In summary, both Al and Gardasil vaccine injections resulted in behavioral and cognitive abnormalities in mice (Figs. 1–3). Furthermore, immunostaining analysis showed an increase in the Iba-1 density in the CA1 area of the hippocampus in Gardasil-immunized mice in comparison to Al-injected mice, thus suggesting that CA1 might be vulnerable to neuroinflammation as a result of Gardasil immunization (Fig. 6). In addition, we observed that the brain protein extract significantly inhibited in a dose-dependent manner, the binding of total IgG isolated from the sera of Gardasil-immunized mice to HPV L1 antigens from the vaccine. Therefore, it is likely that mice immunized with the HPV vaccine developed cross-reactive antiHPV antibodies which in addition to binding to the HPV L1 capsid protein, may also bind to brain auto-antigens. The putative target antigen(s) should be further identified by immunoprecipitation and proteomics analyses (Fig. 5). In light of these findings, this study highlights the necessity of proceeding with caution with respect to further massimmunization practices with a vaccine of yet unproven long-term clinical benefit [20,52] which is capable of inducing immunemediated cross-reactions with neural antigens of the human host. Especially considering the continually increasing number of serious disabling neurological adverse events linked to HPV vaccination reported in the current medical literature (Supplementary Table 1) and vaccine surveillance databases . Finally, in light of the data presented in this manuscript, new guidelines should be requested on the use of appropriate placebos in vaccine safety trials . Yehuda Shoenfeld has acted as a consultant for the no-fault U.S. National Vaccine Injury Compensation Program. L.T. has served as an expert witness in cases involving adverse reactions following qHPV vaccine administration. The other co-authors declare no competing interests. Supplementary data associated with this article can be found, in the online version, at http://dx.doi.org/10.1016/j.vaccine.2015.12. 067. Marra F, Young F, Richardson K, Marra CA. A meta-analysis of intradermal versus intramuscular influenza vaccines: immunogenicity and adverse events. Influenza Other Respir Viruses 2013;7:584–603. feld Y. Autoimmune/inflammatory syndrome induced by adjuvants (ASIA) 2013: unveiling the pathogenic, clinical and diagnostic aspects. J Autoimmun 2013;47:1–16. quadrivalent HPV vaccine Gardasil. J Intern Med 2012;272:514–5. Blitshteyn S. Postural tachycardia syndrome following human papillomavirus vaccination. Eur J Neurol 2014;21:135–9. Poser CM, Behan PO. Late onset of Guillain–Barre syndrome. J Neuroimmunol 1982;3:27–41. Ryan AM, Bermingham N, Harrington HJ, Keohane C. Atypical presentation of macrophagic myofasciitis 10 years post vaccination. Neuromuscul Disord 2006;16:867–9. Exley C. Aluminium-based adjuvants should not be used as placebos in clinical trials. Vaccine 2011;29:9289. Lujan L, Perez M, Salazar E, Alvarez N, Gimeno M, Pinczowski P, et al. Autoimmune/autoinflammatory syndrome induced by adjuvants (ASIA syndrome) in commercial sheep. Immunol Res 2013;56:317–24. Couette M, Boisse MF, Maison P, Brugieres P, Cesaro P, Chevalier X, et al. Longterm persistence of vaccine-derived aluminum hydroxide is associated with chronic cognitive dysfunction. J Inorg Biochem 2009;103:1571–8. Gherardi RK, Eidi H, Crepeaux G, Authier FJ, Cadusseau J. Biopersistence and brain translocation of aluminum adjuvants of vaccines. Front Neurol 2015;6:4. Rigolet M, Aouizerate J, Couette M, Ragunathan-Thangarajah N, Aoun-Sebaiti M, Gherardi RK, et al. Clinical features in patients with long-lasting macrophagic myofasciitis. Front Neurol 2014;5:230. Marrack P, McKee AS, Munks MW. Towards an understanding of the adjuvant action of aluminium. Nat Rev Immunol 2009;9:287–93. Shaw CA, Petrik MS. Aluminum hydroxide injections lead to motor deficits and motor neuron degeneration. J Inorg Biochem 2009;103:1555–62. Li X, Zheng H, Zhang Z, Li M, Huang Z, Schluesener HJ, et al. Glia activation induced by peripheral administration of aluminum oxide nanoparticles in rat brains. Nanomedicine 2009;5:473–9. Zhu Y, Li Y, Miao L, Wang Y, Liu Y, Yan X, et al. Immunotoxicity of aluminum. Chemosphere 2014;104:1–6. Chen L, Yokel RA, Hennig B, Toborek M. Manufactured aluminum oxide nanoparticles decrease expression of tight junction proteins in brain vasculature. J Neuroimmune Pharmacol 2008;3:286–95. Eldred BE, Dean AJ, McGuire TM, Nash AL. Vaccine components and constituents: responding to consumer concerns. Med J Aust 2006;184:170–5. Shoenfeld Y, Aharon-Maor A, Sherer Y. Vaccination as an additional player in the mosaic of autoimmunity. Clin Exp Rheumatol 2000;18:181–4. Shoenfeld Y. Infections, vaccines and autoimmunity. Lupus 2009;18:1127–8. Tomljenovic L, Shaw CA. Human papillomavirus (HPV) vaccine policy and evidence-based medicine: are they at odds. Ann Med 2013;45:182–93. Garland SM, Hernandez-Avila M, Wheeler CM, Perez G, Harper DM, Leodolter S, et al. Quadrivalent vaccine against human papillomavirus to prevent anogenital diseases. N Engl J Med 2007;356:1928–43. Munoz N, Manalastas Jr R, Pitisuttithum P, Tresukosol D, Monsonego J, Ault K, et al. Safety, immunogenicity, and efficacy of quadrivalent human papillomavirus (types 6, 11, 16, 18) recombinant vaccine in women aged 24–45 years: a randomised, double-blind trial. Lancet 2009;373:1949–57. Can A, Dao DT, Arad M, Terrillion CE, Piantadosi SC, Gould TD. The mouse forced swim test. J Vis Exp: JoVE 2012;59:e3638. Tordera RM, Totterdell S, Wojcik SM, Brose N, Elizalde N, Lasheras B, et al. Enhanced anxiety, depressive-like behaviour and impaired recognition memory in mice with reduced expression of the vesicular glutamate transporter 1 (VGLUT1). Eur J Neurosci 2007;25:281–90. Katzav A, Pick CG, Korczyn AD, Oest E, Blank M, Shoenfeld Y, et al. Hyperactivity in a mouse model of the antiphospholipid syndrome. Lupus 2001;10:496–9. Tabata RC, Wilson JM, Ly P, Zwiegers P, Kwok D, Van Kampen JM, et al. Chronic exposure to dietary sterol glucosides is neurotoxic to motor neurons and induces an ALS-PDC phenotype. Neuromolecular Med 2008;10:24–39. Brown JA, Emnett RJ, White CR, Yuede CM, Conyers SB, O’Malley KL, et al. Reduced striatal dopamine underlies the attention system dysfunction in neurofibromatosis-1 mutant mice. Hum Mol Genet 2010;19:4515–28. Harper DM, Franco EL, Wheeler CM, Moscicki AB, Romanowski B, RoteliMartins CM, et al. Sustained efficacy up to 4.5 years of a bivalent L1 virus-like particle vaccine against human papillomavirus types 16 and 18: follow-up from a randomised control trial. Lancet 2006;367:1247–55. Villa LL, Costa RL, Petta CA, Andrade RP, Ault KA, Giuliano AR, et al. Prophylactic quadrivalent human papillomavirus (types 6, 11, 16, and 18) L1 virus-like particle vaccine in young women: a randomised double-blind placebocontrolled multicentre phase II efficacy trial. Lancet Oncol 2005;6:271–8. Mao C, Koutsky LA, Ault KA, Wheeler CM, Brown DR, Wiley DJ, et al. Efficacy of human papillomavirus-16 vaccine to prevent cervical intraepithelial neoplasia: a randomized controlled trial. Obstet Gynecol 2006;107:18–27. The FUTURE II Study Group. Quadrivalent vaccine against human papillomavirus to prevent high-grade cervical lesions. N Engl J Med 2007;356: 1915–27. Verstraeten T, Descamps D, David MP, Zahaf T, Hardt K, Izurieta P, et al. Analysis of adverse events of potential autoimmune aetiology in a large integrated safety database of AS04 adjuvanted vaccines. Vaccine 2008;26:6630–8. Guimaraes LE, Baker B, Perricone C, Shoenfeld Y. Vaccines, adjuvants and autoimmunity. Pharmacol Res 2015;100:190–209. Shaw CA, Li D, Tomljenovic L. Are there negative CNS impacts of aluminum adjuvants used in vaccines and immunotherapy. Immunotherapy 2014;6:1055–71. Exley C. Aluminium adjuvants and adverse events in sub-cutaneous allergy immunotherapy. Allergy Asthma Clin Immunol 2014;10:4. Passeri E, Villa C, Couette M, Itti E, Brugieres P, Cesaro P, et al. Long-term followup of cognitive dysfunction in patients with aluminum hydroxide-induced macrophagic myofasciitis (MMF). J Inorg Biochem 2011;105:1457–63. Agmon-Levin N, Arango MT, Kivity S, Katzav A, Gilburd B, Blank M, et al. Immunization with hepatitis B vaccine accelerates SLE-like disease in a murine model. J Autoimmun 2014;54:21–32. Exley C, Birchall JD. The cellular toxicity of aluminium. J Theor Biol 1992;159: 83–98. Shaw CA, Tomljenovic L. Aluminum in the central nervous system (CNS): toxicity in humans and animals, vaccine adjuvants, and autoimmunity. Immunol Res 2013;56:304–16. Offit PA, Jew RK. Addressing parents’ concerns: do vaccines contain harmful preservatives, adjuvants, additives, or residuals. Pediatrics 2003;112:1394–7. Khan Z, Combadiere C, Authier FJ, Itier V, Lux F, Exley C, et al. Slow CCL2dependent translocation of biopersistent particles from muscle to brain. BMC Med 2013;11:99. Gherardi RK, Coquet M, Cherin P, Belec L, Moretto P, Dreyfus PA, et al. Macrophagic myofasciitis lesions assess long-term persistence of vaccinederived aluminium hydroxide in muscle. Brain 2001;124:1821–31. Lee SH. Detection of human papillomavirus L1 gene DNA fragments in postmortem blood and spleen after Gardasil® vaccination—a case report. Adv Biosci Biotechnol 2012;3:1214–24. Walton JR. A longitudinal study of rats chronically exposed to aluminum at human dietary levels. Neurosci Lett 2007;412:29–33. Xiu C, Ren L, Li M, Liu S, Zhu Y, Liu J, et al. Aluminum chloride- and norepinephrine-induced immunotoxicity on splenic lymphocytes by activating beta-AR/cAMP/PKA/NF-kappaB signal pathway in rats. Biol Trace Elem Res 2014;162:168–74. Caulfield MJ, Shi L, Wang S, Wang B, Tobery TW, Mach H, et al. Effect of alternative aluminum adjuvants on the absorption and immunogenicity of HPV16 L1 VLPs in mice. Hum Vaccin 2007;3:139–45. Food and Drug Administration (FDA). Inside clinical trials: testing medical products in people; 2014. Available from http://www.fda.gov/Drugs/ ResourcesForYou/Consumers/ucm143531.htm (last updated 11/6/2014). Kanduc D. Potential cross-reactivity between HPV16 L1 protein and sudden death-associated antigens. J Exp Ther Oncol 2011;9:159–65. Yonee C, Toyoshima M, Maegaki Y, Kodama Y, Hayami H, Takahashi Y, et al. Association of acute cerebellar ataxia and human papilloma virus vaccination: a case report. Neuropediatrics 2013;44:265–7. Kanduc D. Quantifying the possible cross-reactivity risk of an HPV16 vaccine. J Exp Ther Oncol 2009;8:65–76. van Bogaert L. Are the currently existing anti-human papillomavirus vaccines appropriate for the developing world. Ann Med Health Sci Res 2013;3:306–12. ‹ Most Powerful Longevity Extracts Discovered ?